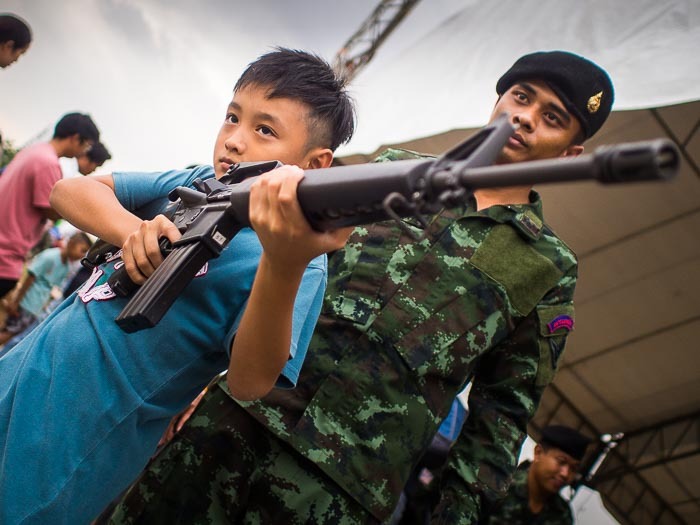 A boy handles a M16 during National Children's Day activities on a Royal Thai Army base. Children's Day is a big deal in Thailand. Government offices throw open their doors so youngsters, and their parents, can see how government works. Shopping malls schedule activities for their littlest consumers. Buses and trains offer free rides to kids. And the military puts their tools on display. Children get to handle the latest assault rifles, machine guns, mortars and tanks. A good time is had by all. 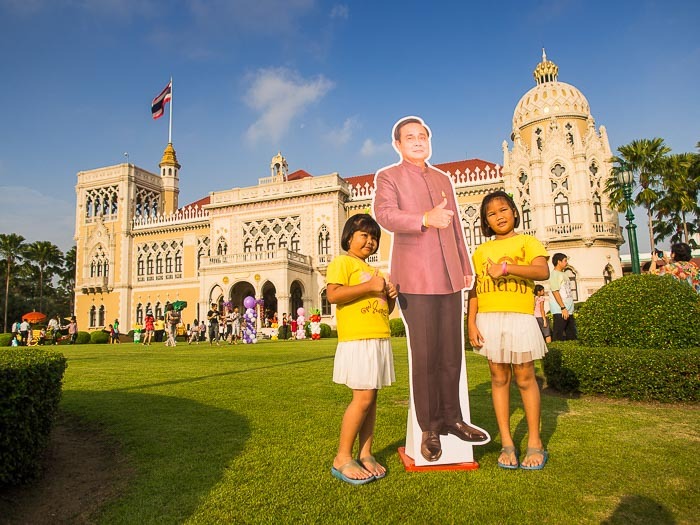 Children pose for photos with a life sized cardboard cutout of Prime Minister General Prayuth Chan-o-cha. 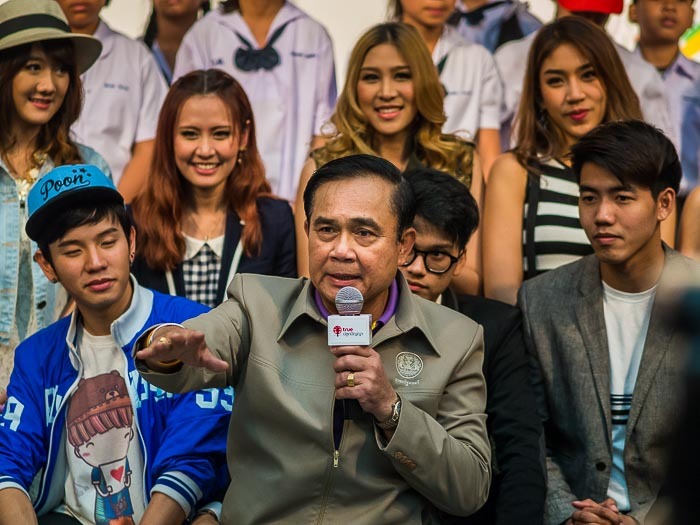 Prayuth took power in May when he coordinated a bloodless coup that unseated the elected government. At Government House, the office of the Prime Minister, there was a full slate of activities including photos with cardboard cutouts of the PM, a puppet show, hosted by the PM, and Thai pop songs, sung by the PM. 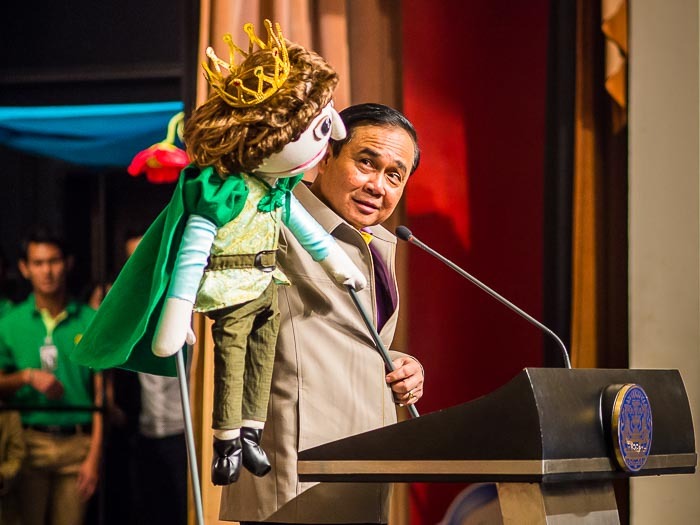 Prayuth puts on a puppet show for the little ones. And a few minutes later did a live TV broadcast with teenagers. Children's Day in Thailand though is not without controversy. This year, Kong Rithdee, an editor at the Bangkok Post, one of Thailand's two English language dailies, wrote a blistering editorial critical of Children's Day huge military presence and the link between the Army's generals and Prime Minister's office, saying, "from tanks to prime ministership, from the barracks straight to the dignified, unelected chair...if that's the official message being sent to children, maybe they should just stick to Pokemon and cosplay."